Marking Machines - all solutions for marking! 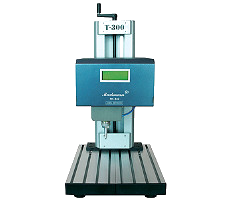 JEIL MTECH has been engaged in manufacturing industrial marking systems in Korea since 1989. They are constantly researching and developing innovative and reliable systems to satisfy theirs customers' needs. The brand name „Marksman” products meet the European CE standard and hold numerous national patents and certificates. On the picture: stand alone dot peen marking machine “MK-300” are designed for small quantity and various kinds of marking. Tungsten carbide marking pin let you have permanent marking to many type of material from plastic to hardened steel up to 62 Hrc.